It deserves a place in your video library. Led by director/co-writer Pete Docter, the Pixar team have once again revealed why they are a brand you can trust for quality entertainment. 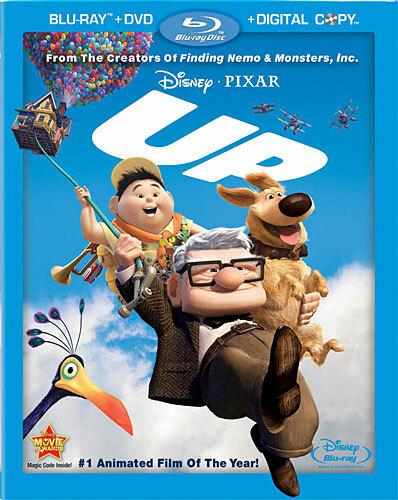 Up is a wondrous film of adventure filled with compelling characters and an engaging, multifaceted story. The Blu-ray does a fantastic job bringing the experience home. When Up opens, we meet two children, Carl and Ellie. They quickly bond over a shared adventurous spirit and an admiration for explorer Charles F. Muntz (Christopher Plummer). Through a montage, their life together plays out. They get married, each work at the zoo (she as a zookeeper and he as a balloon vendor), and save for a trip to Paradise Falls. We also see the hardships they endure, including the loss of a pregnancy and Ellie dying. I was caught off guard by such a realistic conveyance of a couple’s life, but the realism was refreshing for a mainstream animated film. Jumping to present day, Carl (Ed Asner) is a typical grumpy old man and his is the last house in the neighborhood not sold to a corporation that is renovating the area. It’s his only connection to Ellie, and following up on his promise to her, he concocts a plan to get the house to Paradise Falls by flying it with the use of many colorful balloons. Carl accidentally shanghais Russell, a Wilderness Explorer who was under the porch while trying to earn his “Assisting the Elderly” merit badge. They eventually fly the house near Paradise Falls but have to walk it around the ravine to get it in the right spot. They come across a tall, flightless, indigenous bird Russell names “Kevin” before discovering its gender, and a dog named “Dug” who has a collar that gives him the ability to speak. Dug is one of many dogs owned by Muntz, who has been searching for Kevin and other birds of his species to prove their existence for decades. Years ago, Muntz presented a skeleton and was accused of being a fraud. He’ll do anything to get the bird. Carl is indifferent and just wants to get his house to Paradise Falls. However, Russell works to protect his feathered friend against Muntz and his army of dogs. This forces Carl into choosing a course of action, one that speaks to a larger theme of choosing the past or the future. With a very impressive 1080p/AVC-encoded transfer and presented in 1080p at an aspect ratio of 1.78:1, Up looks brilliant. The textures are awesome as a great amount of attention to detail was paid all around to items like clothing, the flooring, and wallpaper in Carl’s house; facial stubble; paper in books; and the aging of photographs. The film is filled with many lush, vibrant colors from the balloons to Kevin’s plumage and Russell’s Wilderness badges. One great-looking scene features a deep red as the sun rises, although it’s the wrong color because the sun looks deep red as it sets. The film also looks very lifelike when the dogs are falling in the water as if it were actual video shot. The audio comes in English DTS-HD Master Audio 5.1 Surround Sound, DTS-HD 2.0, French Dolby Digital 5.1, Spanish Dolby Digital 5.1, and English Descriptive Video Service 2.0. The sound team holds their own with the DTS-HD 5.1 track by creating an immersive experience. Whether the subtle sounds of construction off in the distance in the surrounds to being smack dab in the middle of a thunderstorm, the viewer is placed within the story. Michael Giacchino’s triumphant soundtrack is very evocative and sounds great. The dialogue can always be clearly heard and has a great dynamic range, especially helpful when Alpha’s broken translator projects his voice at a high pitch. Up is filled with high-def extras that will keep fans busy for quite a while. “Partly Cloudy” is the amusing short about where babies come from that has appeared with Up in theatres. “Dug’s Special Mission” is a new short showing what Dug was up to before his appearance in the film. “The Many Endings of Muntz” reveals different options the filmmakers consider for his fate. The creative team’s adventures to South America to research the landscape are documented in “Adventure Is Out There.” “Cine-Explore Commentary” presents a Picture-in-Picture of Docter and co-director Bob Peterson (also the voice of Dug and Alpha) offering an in-depth, informative look at the creation of Up. A second Blu-ray disc offers roughly 45 minutes of documentaries that break down different aspects of the film’s creation from character designs to balloon physics. These are great for people that enjoy the nitty gritty of production. “Alternate Scene: Married Life” goes over the montage and, using storyboards, shows one previously plotted. Promotional materials for the film can be seen in “Up Promo Montage” and “Worldwide Trailers”. The Blu-ray set also comes with a DVD of the film along with Bonus Features and a Digital Copy. Basically, the message of the film is that the real adventure of life is the relationship we have with other people, and it's so easy to lose sight of the things we have and the people that are around us until they're gone….So, if you can kind of wake up a little bit and go, "Wow, I've got some really cool stuff around me every day", then that's what the movie's about. Up is one of the best of 2009 and deserves a place in your video library.